There’s nothing quite as hansom as a well-dressed knight in shining armor, don’t you agree? But perhaps the renaissance clothing of the man in your life needs some, well, sprucing up? Have no fear! Pearson’s Renaissance Shoppe is here, supplying you the very best in renaissance accessories, fitting every single style. From the stylish man, who adores looking cleaned up in royalty, to the rugged knight, ready to take on the seven seas, Pearson’s is your shop for it all! For the Royal King: For the royal knight in your life, fashion comes first! For him, Pearson’s has the latest in renaissance accessories suited specifically for adding a touch of royalty. Shop items such as suede bags with brass accents, imperial-styled boots, leather trimmed cloaks and medieval crowns and scepters. These items are all about standing out, showing off one’s wealth, and simply being the King of the land. The key here is the more glimmering gold, the better! For the Rugged Knight: If the knight in your life is all about excitement and adventure, take a journey through our selection of renaissance accessories perfectly suited for him! 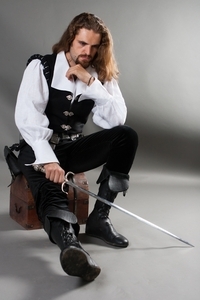 He’ll love renaissance accessories such as leather pirate boots, armory belts with brass accents, pirate pouches, and thick woolen leather capes. These items are not only stylish, but also functional, ready to offer protection when slaying dragons, sailing rough waters, or combating other knights. For the Outdoorsy Noble Peasant: The outdoorsy peasant may not think he is in need of renaissance accessories, but you know that every so often, he deserves some great gifting! Show him your affections by shopping renaissance accessories that are fitting for his outdoor lifestyle. Accessories such as tunics, wrist cuffs, belt pouches and maverick boots are great for this man. They add a touch of style, while remaining useful during his outdoor journeys and adventures. Spruce up the medieval wardrobe of the king, knight, or noble peasant in your life by shopping renaissance accessories! Here at Pearson’s, we know that every man is a little different. Some like the glimmer or gold, others like the rugged comfort of leather, while others still prefer accessories that are more functional than anything else. Fortunately, we’ve got all that and more and our renaissance accessories will turn any pirate into a prince!